Sloe also known as Blackthorn is a shrub belonging to the same genus (Prunus) as almond, cherry and plum trees. Spinosa refers to the sharp spines or thorns that are characteristic of this plant and make it an excellent choice as a "nurse" plant, ie, to grow around other young saplings to protect them from predators. An important plant for wildlife, its early spring flowers provide nectar for early emerging pollintors, and its dense form provides secure nesting sites for birds and makes it popular in hedging. 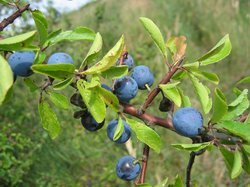 The fruit is referred to as sloes and is best known by the alcoholic beverage sloe gin, although numerous delicious recipies for jellies and preserves can be found. To order this plant please contact us balkanecologyproject@gmail.com. Although this species has not been specifically mentioned, it belongs to a genus where most, if not all members of the genus produce hydrogen cyanide, a poison that gives almonds their characteristic flavour. This toxin is found mainly in the leaves and seed and is readily detected by its bitter taste. It is usually present in too small a quantity to do any harm but any very bitter seed or fruit should not be eaten. In small quantities, hydrogen cyanide has been shown to stimulate respiration and improve digestion, it is also claimed to be of benefit in the treatment of cancer. In excess, however, it can cause respiratory failure and even death. It is in flower in March- April, and the seeds ripen in October. Fruit: Round, dark blue/purple. The fruit is usually used in jellies, syrups, conserves etc and as a flavouring for sloe gin and other liqueurs. Flowers: Pretty and pure white, Flowers commonly appear before the leaves. Wood: Blackthorn wood has been used to make walking sticks, clubs and hay-rake teeth. A shillelagh is a highly polished stick of blackthorn wood that was made and used in Ireland and still is to the present day. Blackthorn tolerates most soils, except very acidic ones, but does not do well if shaded.